These days you can do anything with a phone. You can chat, talk, take a picture or video and guess what you can also invest! Investment apps are one of the fast-growing apps this age because there are many of them entering the mobile platforms at the moment. We have to be grateful to the app developers who are creating the apps with all the convenience needed for investing through mobile phones. It is a great assistance for fresh investors who are planning to invest more in the stock market. Even the most professional and experienced investors would find these apps very helpful as they give them the idea to save money and enhance their portfolios. It is difficult to handle a stockbroker and make the perfect trade. This may also cost the investor more. So a deserving investment app will help you to be comfortable while you are investing without the hindrance of the stockbroker. 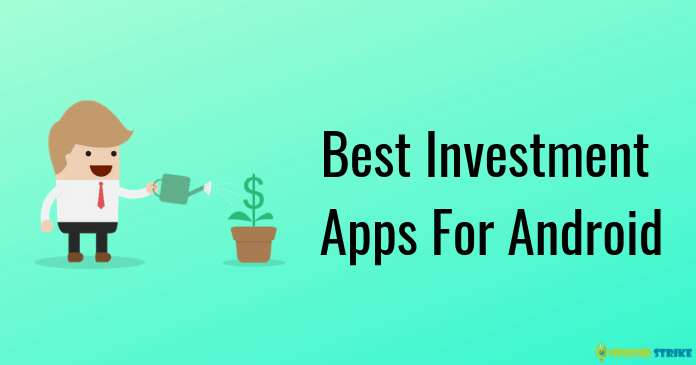 Here are the best investments apps of 2019 which belongs to the category of high quality and standard. This app for many years is used as a standard app to undertake investments. It is also the most popular place frequented by investors. The app provides a tiered commission structure to the users. This is to benefit the frequent traders however it can increase the costs for the casual investors. You have to pay a fee of $6.95 to use the app and then have to maintain the account balance of $500. There is a set of easy to tools in this app and a massive section for investment. The drawbacks of the app are that it offers high commissions for traders with low-volume. You can create a different portfolio with the stash investment app. This app will provide assistance on how to make an efficient investment. The stash app offers educational content to modify and make changes to your investment preferences. You can choose a value-driven portfolio or create your own by making some customizations. You can select the auto stash option to add funds to your choice. This app is best for beginners as it is very basic, but the people who are more professional would not choose it as a great option. Vault is one of the investment apps which is downloaded and used by millions of people around the world. It is perfect for freelancers and self-employed workers as it can create and display your retirement plan. Vault app permits its user to create an IRA account. You can choose to invest a particular percent from your income by using vault. Without any manual approval process, the amount you invest can be automatically uploaded. The model of the pricing of the vault is similar to stash and acorn. This investment app is the largest and the most well-known app in the investment world. The app is available in the ios, Android and Blackberry systems. It is a free app and does not require a minimum account option to get started. There is good customer support in this app for convenience because more than twenty educational videos are there for you to get the knowledge regarding the skill for investment. It offers the higher than average trading commissions with the best service. There are research and trading tools for you to benefit from. It can make the hardened investors as well as the casual investors happy with the continual plans. However, one flaw in the app is its higher commissions and expensive trades. This is a savings app that is based on the investment of your funds in the portfolio of the vanguard which is the exchange-traded funds (ETFs). You can be quite tough in investing with the help of this app. You can create a certain percentage of the purchases you make. This can be added to your clink account. For instance, if you spend a certain amount in dining out, you can choose to transfer this to the clink account you possess. You can plan the regular transfers from your account in the various options present in this app. There is no minimum investment in the clink app. Sir Robin of Locksley, who is famously known as the character Robinhood is a legendary folk hero who steals money from rich and provides it to the poor. This app encourages investors to join in the stock market. The stock trades available on Robinhood are completely free. Free is not absolutely free, but it comes with certain costs and fees. The trade transactions can be processed with zero percent commission fees. It is very simple to download this app which does various trade transactions. The app should be linked with your bank account, and you have to fund the account to make trade deals and transactions. The Wealthfront app is for the people who want to use the passive investment to develop their wealth. The app contains excellent inbuilt intelligence to aid the investors to increase their investments. You can also invest according to your risk tolerance in this app. Begin the connection with your precious accounts in the app, and it will check and take care of your transactions. You can learn about your finances in this app. It considers your spending and aims to make a plan. Your goals and ideas will be personalized for you in this app. The app will invest your money up to 11 ETFs. The funds will be rebalanced regularly for periods which will be based on the deposits and fluctuations in the market. It also contains few features such as a 529 college savings plan as one of the future plans for investment opportunities. Acorn is the perfect app which is suitable for investors who don’t always think about investments but contribute a lot. Using Acorn is very easy as you can effortlessly link your debit or credit card to make transactions and invests the spare change. Acorn regularly invests in the portfolios for you. It is the most excellent app available for small dollar transactions. These are some of the best investment apps suitable for your android mobile.